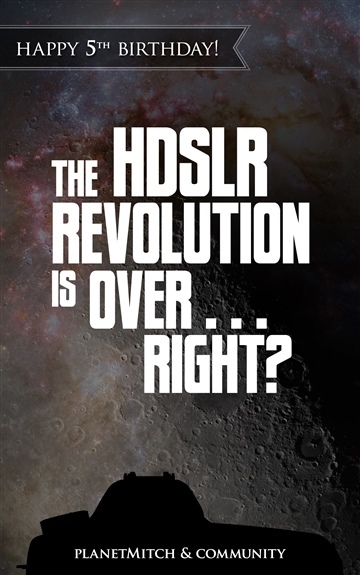 The HDSLR Revolution is Over... Right? The Canon EOS 5D Mark II created a revolution in filmmaking - but it was introduced over 6 years ago - Is the revolution still happening? On the anniversary of the beginning of the revolution, I thought about creating an ebook about the history of the Canon EOS 5D Mark II and predictions for the future of HDSLRs. I thought about writing the e-book all by myself and giving my opinions and going thru the history of the 5D2 and that just didn’t seem quite enough. So I asked as many people as I possibly could where they thought the HDSLR revolution was going from here. I didn’t give the much direction other than a few suggested topics. I decided it would be best if everyone formulated their own opinions based on their own current viewpoints. We have over 30 amazing responses from industry leaders, plain folks working with HDSLRs and other cameras daily, as well as from people all around the world. You can find all of that in the ebook! It is well over 130 pages! Also, you’ll find in the addendum, a transcription of a conversation that was held in the teradekbooth at NAB 2013 called “Is DSLR Dead?” The panelists were Matthew Allard, Jason Wingrove, Paul Schneider, and Andy Shipsides. Sign up to get planet5D in your email inbox and never have to think about where to find HDSLR news again: http://blog.planet5d.com/join and you'll get that new ebook on 4k Video as well! Over the last 5 years, planetMitch has become a leading authority in the world of DSLR video and photography. He has written over 2,500 articles and blog posts covering various advancements and news regarding the latest cameras, software, filming breakthroughs, and more for his blog — planet5D. planet5D has become the ultimate resource for insider industry information, educating hundreds of thousands every month, and Mitch is the orchestrator of this wealth of valuable information. planetMitch sources his information straight from the top industry professionals, and has interviewed over 40 of the most successful names in DSLR production, including Vincent Laforet, Shane Hurlbut, Rodney Charters, Gale Tattersall, Lisa Bettany, Barry Andersson, Richard Harrington, and Catherine Hall. planetMitch has perfected his ability to share the lessons he absorbs from the experts with filmmakers around the universe, as he facilitates forums, writes articles, and has been featured on roughly 100 podcasts over the last few years. A lover of photography since his early days, he graduated to selling stock photos to make a little bit of spare cash. It wasn’t much, but it allowed him to upgrade to better cameras as well as computers, and it wasn’t taking money away from feeding his family. September 2008 rolled around, and Canon announced this new version of the incredible 5D — the Canon EOS 5D Mark II. It was the first Canon DSLR to shoot full HD video and the earth moved! (It really was a huge deal in the photography world.) planetMitch knew if there was ever a chance to ride a wave of something he was really passionate about, this was it — and the blog at planet5D.com was born and thru planetMitch’s enthusiasm and passion, planet5D flourished. planet5D is now one of the most popular DSLR video blogs on the planet, and he is making a full-time living from blogging.